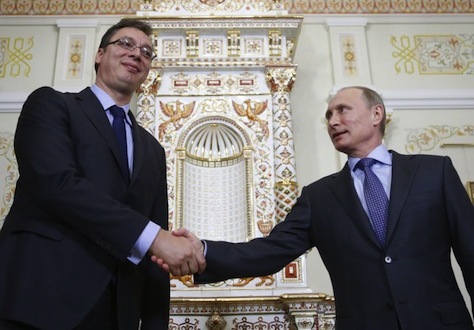 Russian president Vladimir Putin travel to Belgrade on Thursday with a warm welcome from Serbian prime minister Aleksandar Vučić (pictured above, left, with Putin) with parades and fanfare. Even as a shaky ceasefire between the Ukrainian government and pro-Russian eastern separatists limps forward, US and European policymakers continue to keep a wary eye on the Baltic states and Ukraine. Just over a month ago in Tallinn, US president Barack Obama disabused Putin that NATO would flinch in its response to any Russian attack against any of the Baltic states. Russian aggression may have nudged Latvian voters into reelecting a center-right government otherwise unpopular after a half-decade of economic malaise and budget austerity, and Russian relations are certain to play a vital role in Ukraine’s snap parliamentary elections in less than two weeks. 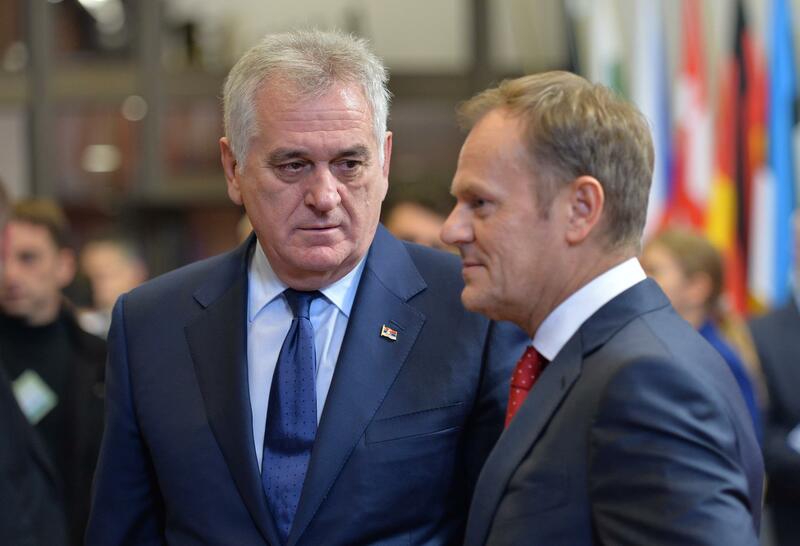 Nevertheless, Western strategists may be overlooking Putin’s ability to undermine both EU and NATO resolve through the Achilles’ heel of southeastern Europe by leveraging economic, political and cultural influence in Bulgaria, Hungary and Serbia. While it’s hard to believe that Russia would assume the economic burdens of annexing large swaths of eastern Ukraine and even harder to believe that it would risk World War III by invading Russian-majority territory in Estonia, Russia could easily, quietly and gradually maximize its influence within southern Europe, a region that continues to suffer inordinately from the fallout of the global financial and eurozone debt crises. 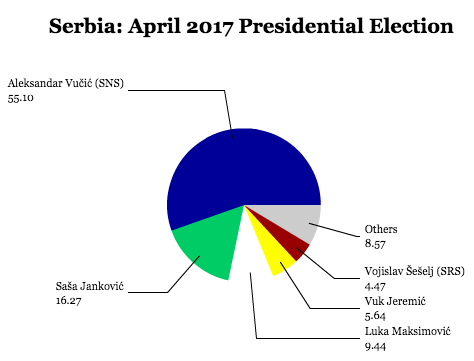 It’s been a relatively active spring, politically speaking, in the Balkans, what with Serbian elections in March elevating Aleksandar Vučić to the premiership, Macedonian elections in April that brought a fourth consecutive term for the center-right government, and Slovenian elections next month after the resignation of its first female prime minister Alenka Bratušek. 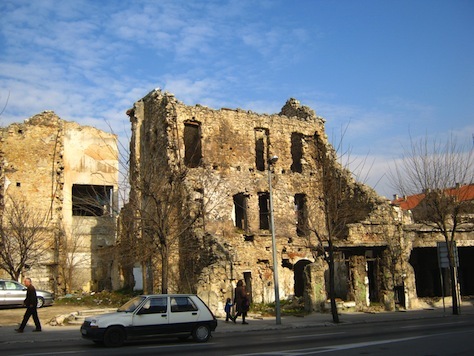 But on June 8, it was Kosovo’s turn, where the country held elections that, for the first time, featured the participation of the Serbian minority in North Kosovo. 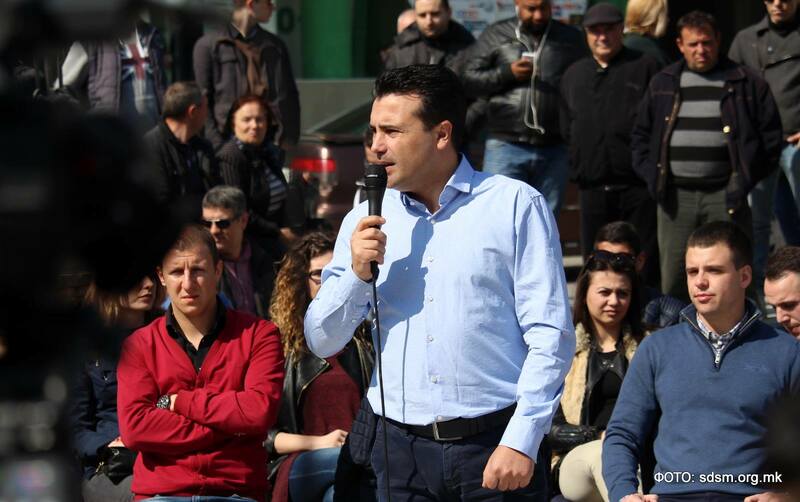 Preliminary results gave the governing center-right Partia Demokratike e Kosovës (PDK, Democratic Party of Kosovo) a narrow lead of around 30.72%, to just 25.72% for the opposition center-right Lidhja Demokratike e Kosovës (LDK, Democratic League of Kosovo), which is led by Isa Mustafa, the mayor of Priština, Kosovo’s capital, between 2007 and 2014. 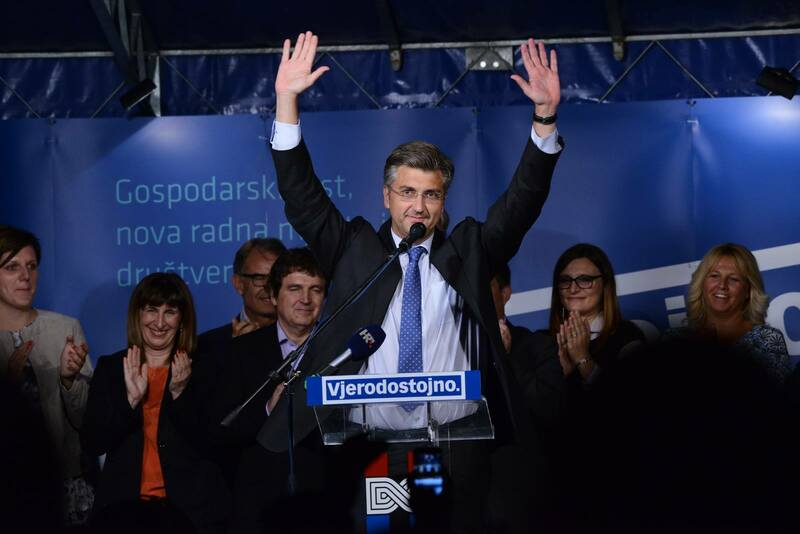 The left-wing nationalist Vetëvendosje (Self-Determination) won just 13.51%, despite its breakthrough performance in last December’s local elections, which its mayoral candidate, Shpend Ahmeti, wrested control of the mayoral office in Priština. 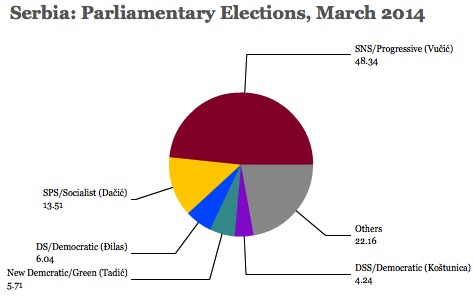 Throughout Kosovo, turnout climbed only to around 41.5%, less than the 47.8% turnout in the last election in 2010. 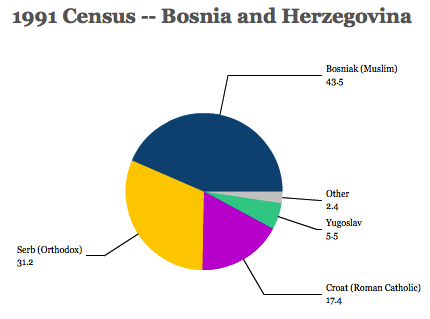 Turnout was even lower in North Kosovo, home to the country’s predominantly Serbian minority population. 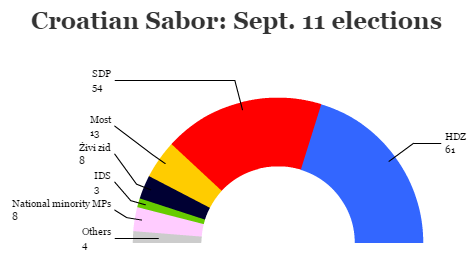 Nonetheless, the Srpska lista za Kosovo (Serbian List for Kosovo) won 4.51% of the vote nationally, a marked increase in voter share, if not in seats, given that 10 seats in the 120-member Kuvendi i Kosovës (National Assembly) are reserved for the Serbian minority. 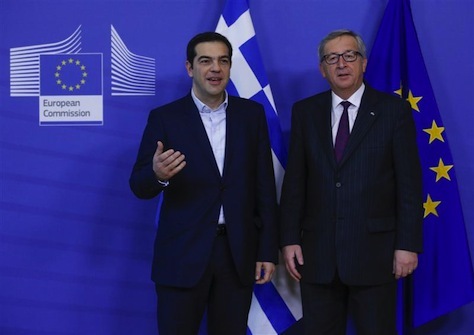 Another 10 seats are reserved for additional minorities, ranging from Turks to Croats to Egyptians to Bosniaks to Romani. 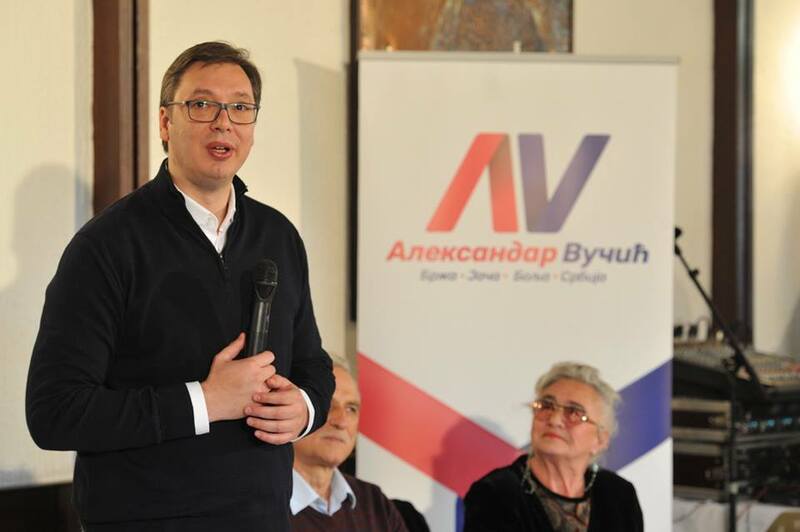 Vučić himself encouraged Serbs in North Kosovo to vote, and his government commended the increase in turnout, which was nonetheless lower than in 2013 local elections. 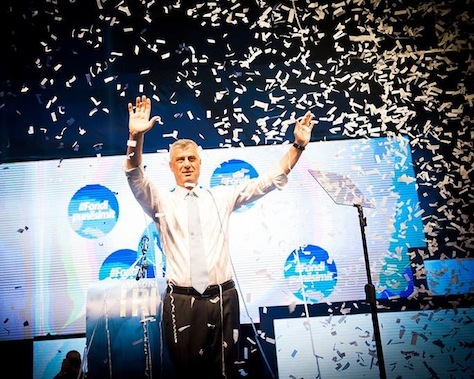 The likeliest result is a third consecutive term for the government headed by Hashim Thaçi (pictured above), the leader of the DPK, a former leader of the Kosovo Liberation Army, and Kosovo’s prime minister since 2008. 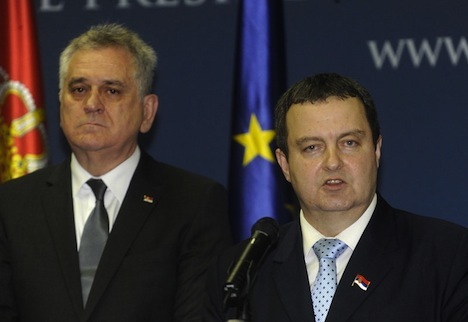 Thaçi currently governs in coalition with a handful of small parties and the National Assembly’s ethnic Serbs. 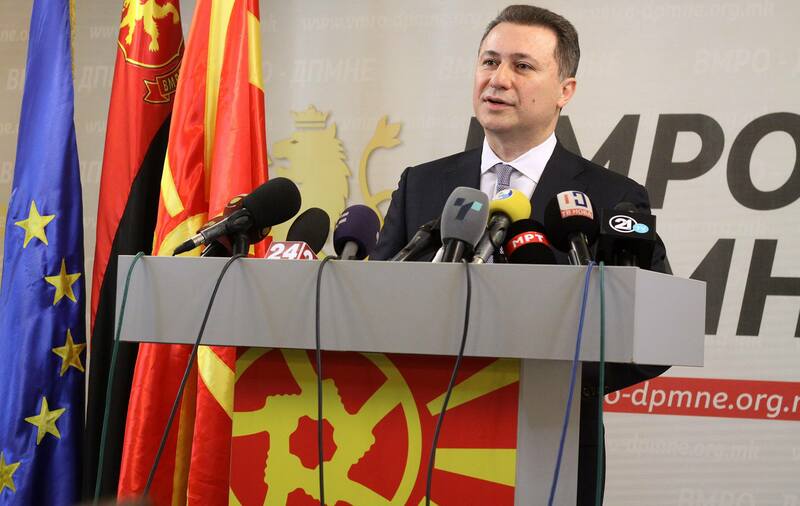 He’ll have to assemble a similar coalition again — or otherwise turn to a ‘grand coalition’ with the LDK and/or Vetëvendosje. 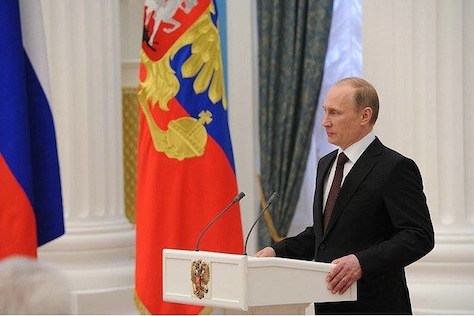 In his wide-ranging speech announcing the Russian Federation’s annexation of Crimea from Ukraine, president Vladimir Putin had some choice words for the West: If you don’t like what Russia did in Crimea, you only have yourselves to blame — on the basis of the precedent in Kosovo in 1999. 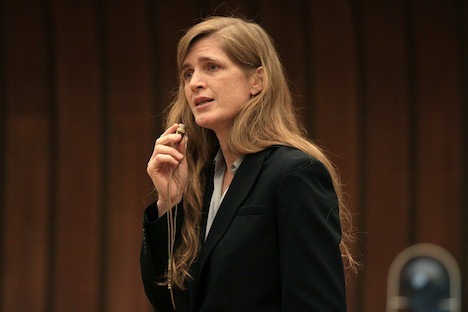 Gessen, in an otherwise fabulous essay that starts with her own days as a war reporter in the late 1990s in Serbia and Kosovo, retells the story of the Primakov loop — a moment that Gessen argues represents a key pivot point in US-Russian relations, when the NATO governments essentially left Russia out of the loop with regarding its campaign against what was then still Yugoslavia and the regime of Serbian strongman Slobodan Milošević. 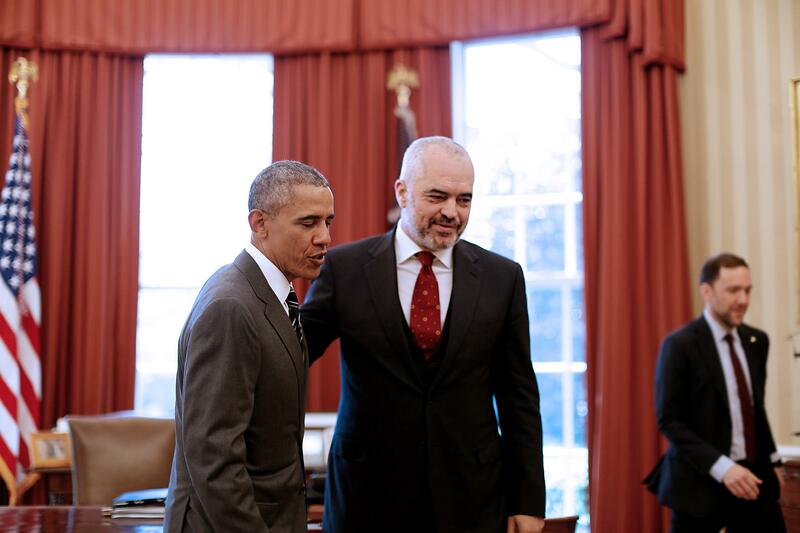 Ironically, even as the 1999 Kosovo precedent has increasingly become a flash point in the current war of words between Moscow and Washington, Serbians went to the polls on the same day as the Crimea referendum. 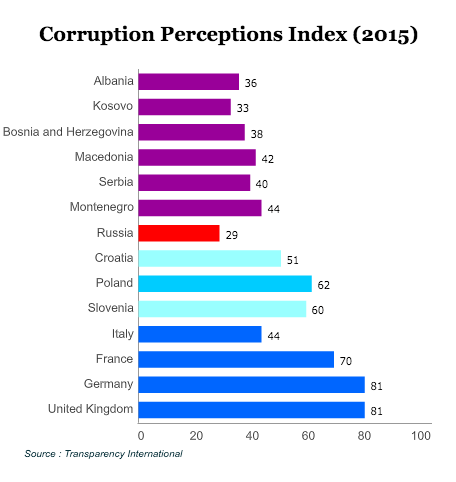 They elected a majority government under center-right Progressive Party leader Aleksandar Vučić, a government that will be firmly focused on accession to the European Union, which has dangled the economic incentives of EU membership to advance a political settlement between Serbia and Kosovo. Nonetheless, to understand the Putin doctrine of the 2010s, it’s worth revisiting the origins of the Primakov doctrine of the 1990s, which defined US-Russian relations and European-Russian relations in the same ‘zero-sum game’ terms. Yevgeny Primakov is one of the more fascinating figures to emerge out of the presidency of Boris Yeltsin. 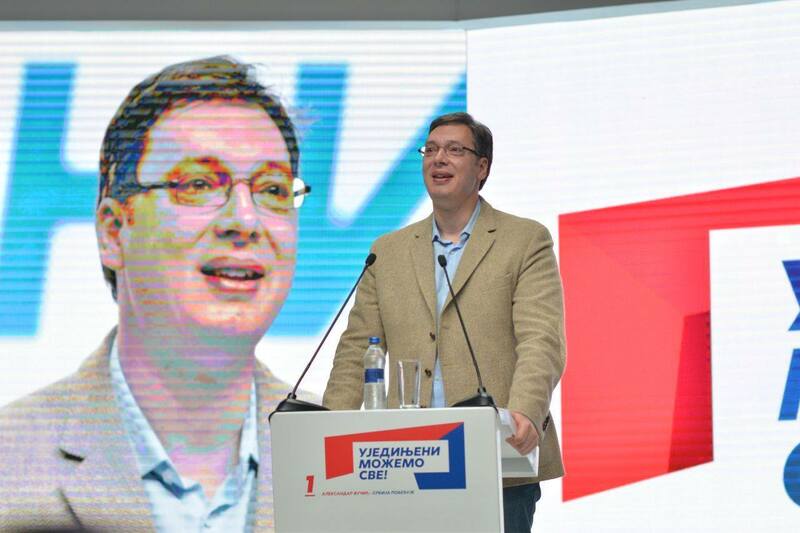 Who is Aleksandar Vučić? Serbia’s next prime minister. 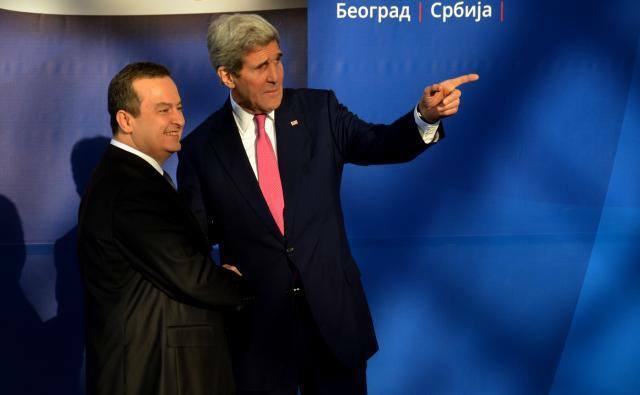 While most of the world fixes on Crimea’s sham referendum and the growing standoff between Russia and the United States, an arguably far more important vote took place in another country on Sunday with strong ties to both the European Union and Russia — Serbia. 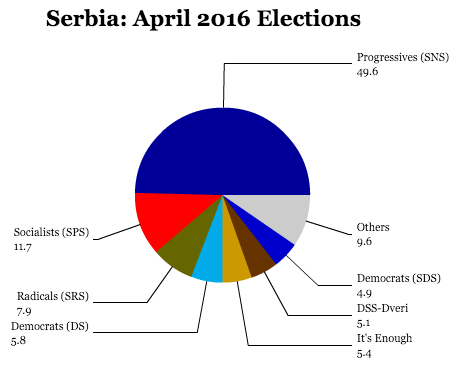 It’s difficult to imagine that the center-right Serbian Progressive Party (SNS, Српска напредна странка) could have done much better. Following Sunday’s vote, the Progressives will control 158 of the 250 seats in the National Assembly (Народна скупштина). 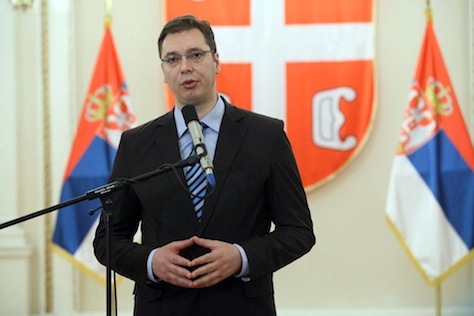 It also means that Aleksandar Vučić who served as minister of defense and first deputy prime minister in the previous government, will almost certainly become Serbia’s next prime minister. 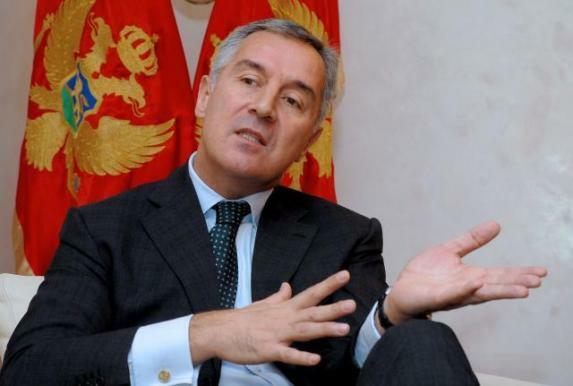 What’s more, he will also become Serbia’s most powerful leader since the fall of Yugoslav strongman Slobodan Milošević in 2000 — and potentially, the most powerful leader in the Balkans since Milošević. 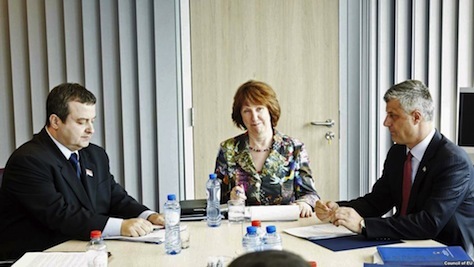 RELATED: The most important EU success story you’ve never heard? 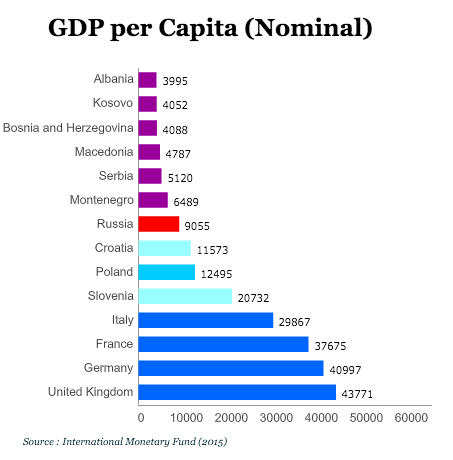 Serbia.